Burrington Hill was founded around 1960 by the late Chet Page of Whitingham, Vermont. The area was a classic mom and pop operation, which taught many folks how to ski. The area was located high up in Whitingham, with a vertical drop of 200' and had a northwestern exposure. As you can see in the picture below, most trails were fairly narrow. Chet Page, at the top of the poma lift. 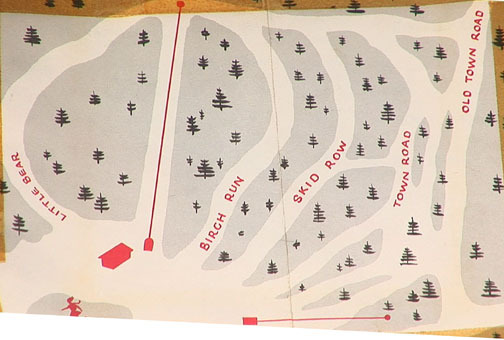 This trail map, taken by Art D. from the Vermont Ski Museum, shows the five trails. The main lift lift was the Stabil Disc Lift, and the beginner tow is also shown. 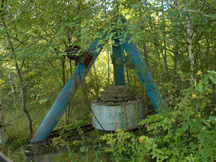 The area operated a 986' Stabil Disc lift invented by Bill Jenkins. 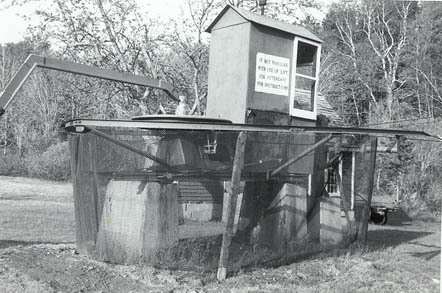 This was a homemade lift which resembles a pomalift or platterpull. 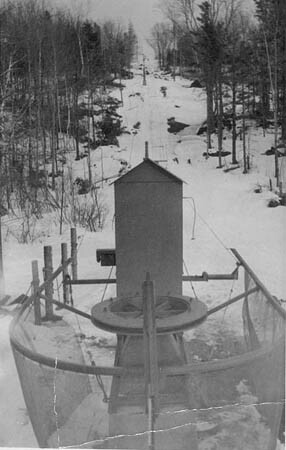 Only a few others were ever built - 2 at Birdseye, VT; 1 at Underhill, VT; and 1 at Temple Mountain, NH. Here's a view of this unique lift, from Bill Jenkins. Notice how the poma lift swings out from the cable. This poma did not detach, and you would grab a hold of it and swing it under you. This picture also shows the small size of the area - this is about all the hill there was. However, despite its small size, Burrington Hill was popular with many people looking for a smaller ski area to learn, and not feel lost in the crowd. Here's a view of the beginner's rope tow, through an opening in the trees. During the mid 1960's, Mount Snow was calling itself the largest ski area in the world. To counteract this, Burrington Hill called itself the "smallest ski area in the world". 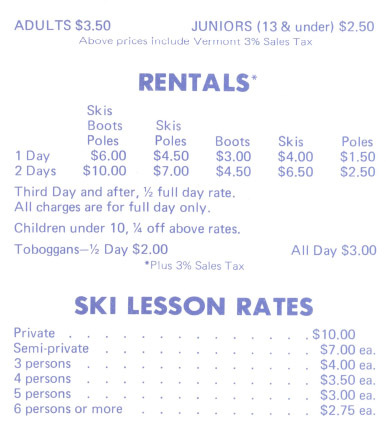 What a great marketing idea - they made no apologies on their size, and didn't try to act bigger than they were, but they did offer honest skiing for cheap prices. The area operated definitely until 1971. From 1971-1974, the official VT Tramway Inspections do not list the area. It is likely that the area did not operate for a few years. One guidebook lists it in 1973, but may be an old listing. In 1974, the area was bought by Ed Tanny, who operated the area until 1978. Burrington Hill closed that year. Today, the area is on private property, and there is little remaining. Some houses have been built on or near the slopes, and the rest of the trails have grown in. Chester Page III, the grandson of Chester Page who founded Burrington Hill shares with us his memories and photos of the area: Click on all photos to view a larger version. 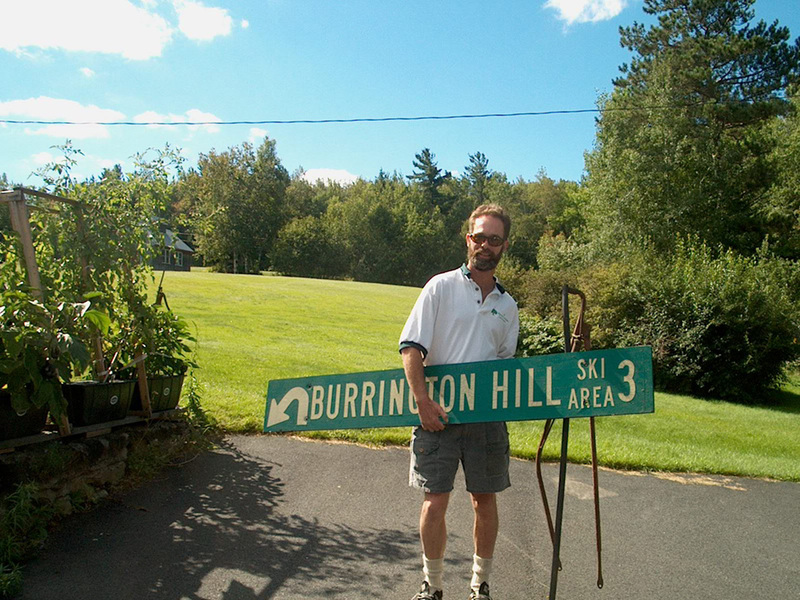 My grandfather built and ran Burrington Hill Ski area from the early 60's to the mid 70's. Chet Page was the one-man band from patrol to ski teacher to trail groomer to lift mechanic as each chore became necessary. He billed it as "The World's Smallest Ski Area " in deference to nearby Mount Snow's claim to being the world's largest at the time. My winters were spent bombing down the trails jumping every bump in sight. He let me carry a little pack with some band-aids and tape and called me a junior ski patroller. Special memories include stacks of blueberry pancakes hot off the grill on the wood cookstove of the old farmhouse, the blueberries having been picked that summer from the high bush plants on the ski trails; to winter swims in the outdoor heated pool which he kept between 98 and 102 degrees. Winter swimming came with strict instructions not to run on the deck of the pool due to the danger of ice forming on your feet; hard to follow rules when the air temp was in the teens and you needed to get to the dressing room, fast! A highly technical grooming device was a piece of chain link fence towed behind the snowmobiles to break up crusty conditions. One of the trail names and his logo for the ski area of a skiing bear came from a bear cub he rescued from a tree in the middle of a forest fire. He had a log cabin and an A-frame for rentals and a handful of rooms in the farmhouse to lodge guests, Non-skiing guests could swim, ice skate and toboggan, so he was ahead of the curve, yet of course still primitive compared to today's multi-faceted resorts. Summer visits included fishing in the half-acre pond stocked with trout and nightly swims in the still very warm pool. 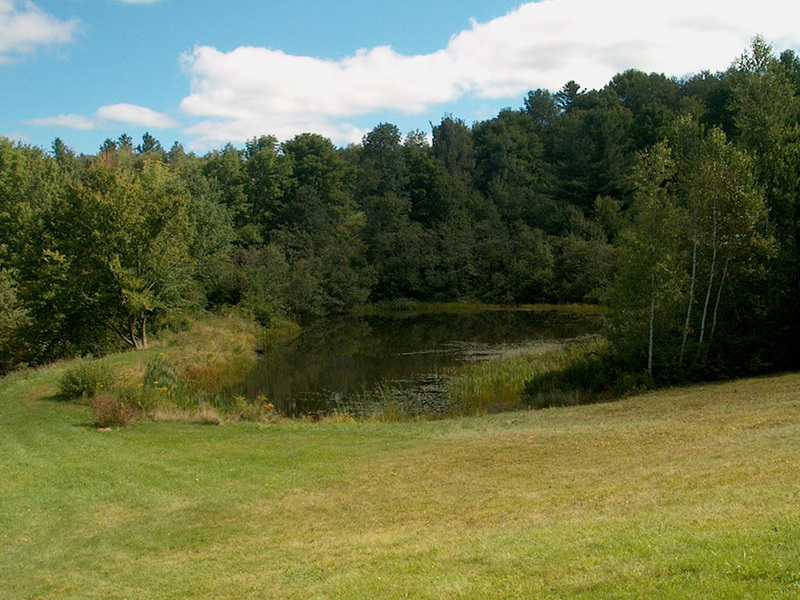 The photo on the right shows the pond in 2003 on the day of my step-grandmother Page's funeral. I've continued working at Vermont ski areas in the following thirty years and will be forever thankful for my start with the help of Grandfather and Grandmother Page at the "World's Smallest Ski Area." Chester Page III with a sign that directed you to the area from the town of Jacksonville and a disk lift piece the current owner graciously donated to him. 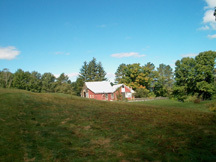 The house and barn which served as the lodge/cafeteria. Counterweight for the Disc Lift. 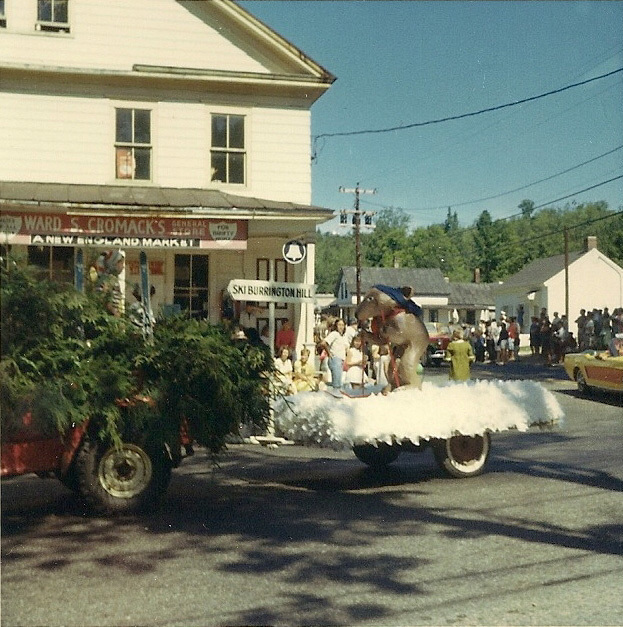 A float for Burrington Hill in a 1966 Old Home Week parade in Whitingham, VT. It sports a papier mache bear and hundreds of white napkins for "snow" Chester III, Ann and Lesley Page looking up toward the disc liftline above the ski rack with Birch Run visible above Lesley. Lesley, Chester III, Ann and Chester Jr. at the base area near the lodge. 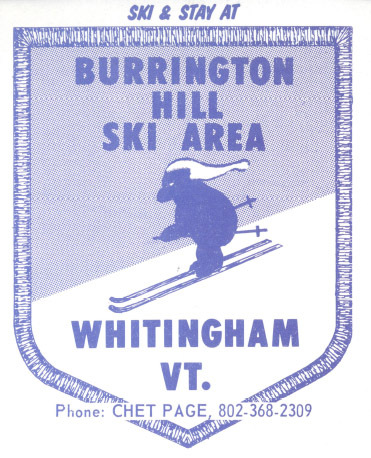 Cynthia Jes Wiesner: I learned to ski in the '60's - at Burrington Hill in Whitingham, Vt. It was in a lovely farmhouse's backyard (the house is still there) with just a t- bar (disc lift)... We used to go skiing with the Whitingham school program...It overlooked town hill and had quite a lovely view of Lake Sadagwa and not far from Brigham Young monument. 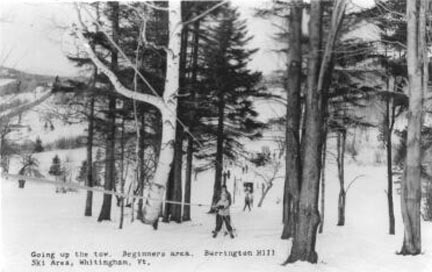 Sandy Northrup: Even smaller was an area known as Burrington Hill in Whitingham Vermont. It had one poma (as in platterpull) that took you up a couple of dozen yards and a rope tow that served a gentle beginner slope. The lodge was a converted barn. It was a great family and learning area that had maybe a hundred skiers on a great day. I remember skiing it often throughout the 1960's, maybe even into the early 70's. There are several new homes scattered across the old trails now, but some of those trails are still visible as shadows to those who know where to look. Tony Ostroski: The ski area was in operation in the mid 50's to early 60's. I remember going there several times in the early 60's. They had one "modified" Poma Lift and a rope tow. The "modified" Poma lift was a disk just like the present day Poma lift except the bar never detached from the cable. You would have to grab the bar and place the disk between your legs while the lift was moving. I went hiking there in the early 90's and there are several houses built on the upper slopes and you can still see the lift towers in the woods. 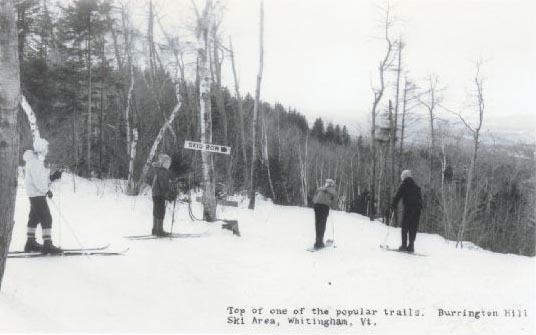 The area was run by a local family and located on the farm just off route 100, 3 miles south of Jacksonville, Vermont not far from Brigham Young's Monument in the town of Whitingham, VT.
Ruth Hedberg: In Whitingham, VT - southern part of state, there was Burrington Hill Ski Area. Basically a backyard operation owned by Mr. Page. Was still operating in the 60s I think. Earle Bestick: Burrington Hill was a small area in Whitingham Vt, just behind the Statue of Brigham Young. 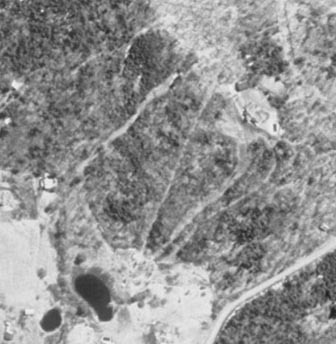 The area was owned, (or run) by Chet Page, had 3 or 4 trails ,a snack bar, ski school, a nice pond where night skating took place. Chet had a homemade trail groomer made from an old John Deer Dozer. With 2x4 pine extenders on the tracks 4 ft wide. 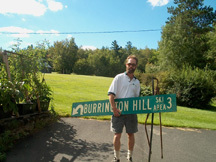 Michael J. Hahn: I was on your web site and to my surprise I saw Burrington Hill. My Grandparents lived next door to Chet. If you were facing the ski area from the road they live in the house to the left. It was a white and green house. I used to walk to the area and go skiing. Since my Grandparents knew Chet quite well my brother and sisters skied for free. I can remember a time when Chet pick up my sister and threw her in the pond one summer. We had such a good time up there. 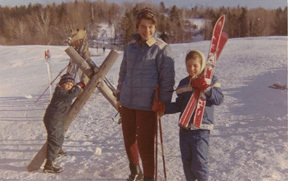 Dan Scharfman: My family learned to ski at Burrington Hill, starting in 1962 or 1963. 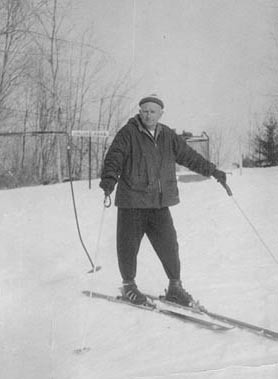 It all seems quite vivid to me: lace boots, the earliest of the early release bindings, wooden skis, but most of all Mr. Page. He took a real interest in us and in our skiing safely. The very first lesson was on the open slope above the lodge and near the rope tow. We spent the whole time learning to fall down without getting hurt, which I (at 6 years of age) thought very funny. I think now that he knew how it would make us equals on the slopes and push fun and safety above pride. He taught us well. We have between us skied for nearly 200 years, and the worst injury has been a sprained thumb (at Hogback, by the way). The rope tow required special gloves with leather palms, and it took some time to get used to the jerk as it took off. The ride up seemed very long indeed as I dragged, sometimes in my parents' arms and sometimes alone. It was not until the 2nd or 3rd year that I rode the poma. Even then it lifted me off the ground from time to time, and I'd pray that I would last to the top. Skid Row (a trail) always scared me silly, but as soon as my older brother had come down I wanted to try it. What a great place to conquer fear, knowing that if I got into trouble Mr. Page would rescue me. He did not have to, but I did practice the safe fall techniques a few time. After a few years we moved on to larger areas, especially Haystack and "Big Bromley" with, as my mother called it, the "scarelift." But Burrington Hill remains special to my whole family. 1. It needed to have something that my non-skiing friends could do. 2. I wanted to go to a place where I had never been before. The White Book indicated that Burrington Hill had a pool, so I packed my skis and my friends packed bathing suits. When we got there, we discovered that while there was a pool, the pool was outdoors and quite frozen over. I took a few runs on the hill to log Burrington Hill as an area that I skied. My friends waited patiently and then went home! Peter Collery: In the late 1960s I was a ~10 year old who lived in Amherst MA and my parents, who didn’t ski, decided my sister and I should learn to. As I recall, other kids in the neighborhood were going to Burrington and we started joining them. It was an ideal place to learn; very low key. I remember a great feeling of accomplishment when I mastered the poma lift. I also recall my favorite run being called “Little Bear”. Whichever parent drove us was generally very content to sit in the lodge by the fire and read. I thought the heated outdoor pool in the wintertime was the most profligate thing I’d ever seen. Callie Mack: My brother Alan and I remember skiing Burrington Hill, probably in 1969-71 or 72. 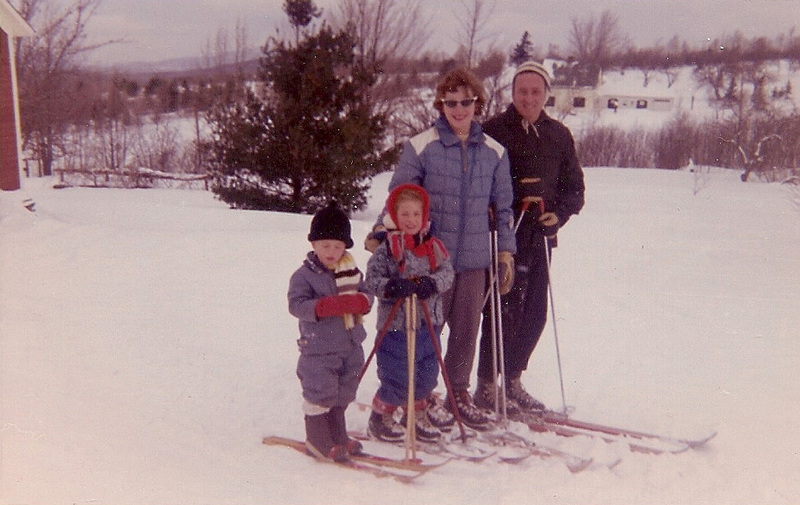 (My parents separated in 1970 and money was tight, so we were looking for bargain ski areas!) It was a wonderful, affordable small family-style area, and we had a fabulous time skiing there. It seemed a fairly good-sized area to me as a young teen, but then I hadn't skiied many large areas at the time. I remember the poma-type lift (when we started skiing there, it was the first time I'd ever seen one) and the rope tow, and I also remember vividly the swimming pool, (which I think at the time may have been heated; I seem to remember steam, but I'm not sure), and the really bizarre ladies' restroom attached to the "lodge". It seemed to have been cobbled together out of a number of parts, as I recall. I also remember seeing their ski patrol and/or maintenance people scooting around on what looked to me like the world's oldest snowmobile. It was a genuine antique in the early '70s; if it showed up on Antiques Roadshow today, it would probably be worth a fortune! It looked deceptively decrepit, but always seemed to be running. Anybody else remember that ancient snowmobile? My family bought a place in Whittingham in the late 60's. I believe we skied at Burrington Hill in the winter of 69 and 70. There weren't too many people there then but it was a great place to learn to ski. I remember first learning to fall down before we "Took to the trails" - Town Road and Old Town Road, Skid Row and Birches. We took lessons from Mr. Page and Jerry. Some days we were the only ones there. I remember Easter when I was there with a friend and Mrs. Page asked if it was ok if they closed the lift for an hour so they could sit down and have Easter Dinner with all the employees. It was a beautiful day so we sat outside and ate our lunch and then skied the afternoon. Skid Row, a popular trail at the area. Photo courtesy Michael McMorrow. 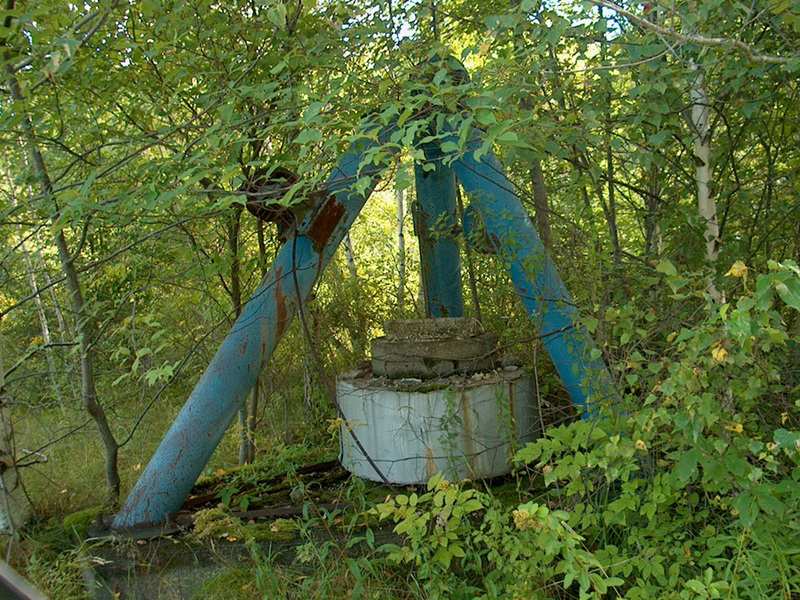 The base of the lift, 1964, from Bill Jenkins. 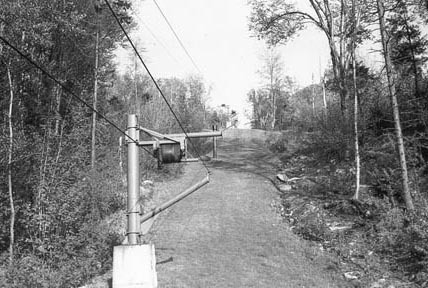 Looking up the lift line, 1964. Courtesy Bill Jenkins. The front of the brochure shows their patch, with the ski and stay ad as well. 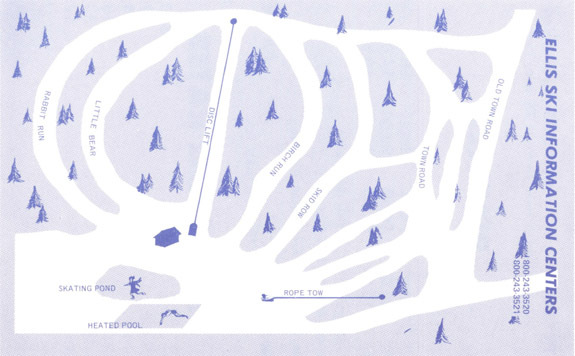 The trail map of Burrington Hill is similar to the map shown earlier, but has the two lifts labeled. You can't go wrong with those prices! 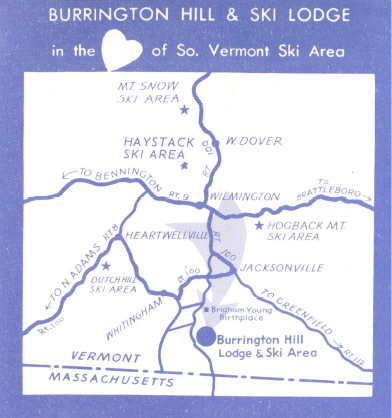 This map shows the location of Burrington Hill in Southern Vermont. If you remember this ski area and have more memories or photos to share, just let us know.